Liberty 2.5 dollar gold coin values are rising with the precious metals. The minimum you would expect to receive is $230 each. However, looking at the value chart below, there are at least a couple of reasons why certain coins quickly break away from this minimum value. First, rare dates. For example, the few surviving coins dated 1885 are worth over $600. And it is only one of many, very rare and valuable dates in the Liberty head gold series. Second, what is the condition of your coins? Rare dates are one factor. But, nice looking, high condition coins are very appealing to collectors and highly valued. Pictured is a stunning Liberty $2.5 gold piece, a very desirable coin, not because of the date, but its condition. Any collector would gladly pay a premium for such a coin. Find the highest accurate value of your old gold coins by judging their condition, see more about this below. And then checking the value chart. Notice that dealers and collectors pay a premium for quality. Liberty 2.5 dollar gold coin values reflect this. Study your coins carefully, not only looking for rare dates and rare mintmarks but for coins in rare condition. 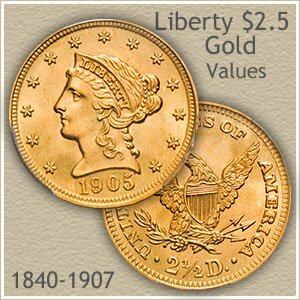 A close and careful examination of your Liberty 2.5 dollar gold piece often leads to discovering a higher value. The reason is the condition of your coin. A heavily worn coin in most cases is worth close to bullion value. The highest premiums are paid for coins in "Uncirculated" condition. Grading gold coins. Compare your coins appearance to the grading gold coins image and judge its condition. As a coin circulates elements of the design wear and disappear. Each stage is assigned a "Grade". A coin with the very slightest of wear is in "About Uncirculated" condition. In "Extremely Fine" condition wear is apparent in the hair above the forehead of Liberty, and little luster remains. A "Very Fine" coin shows moderate even wear over the entire coin. Because of the expertise required to grade accurately, the high value 2.5 dollar Liberty gold coins and the large difference in value from one grade to the next, most are submitted to a grading service. To see this in action, check a few rare coin dealers' listings, look for those offering old US gold coins similar to yours. Their listings and prices include a notation of the NGC or PCGS assigned grade. Additionally, these coin dealers are potential buyers of your coins. A small detail but necessary in determining Liberty 2.5 dollar gold coin values. Mintmark location is on the reverse just below the tail feathers of the eagle. The different mints placed mintmarks on each coin to indicate their origin. The Dahlonega mint in Georgia used a "D", the Charlotte, North Carolina mint a "C", San Francisco an "S" and the extremely rare "O" denotes the New Orleans Mint. Philadelphia, the main mint did not use a mark. 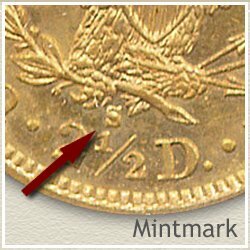 Date, mintmark and the preservation of your coin. 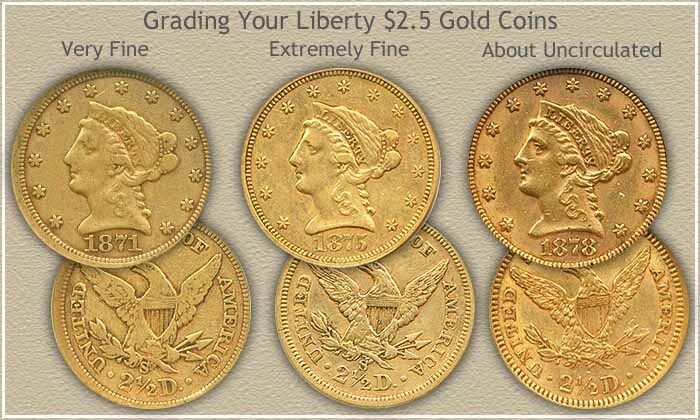 All combine to produce a wide range to Liberty 2.5 dollar gold coin values. Handle your coins gently, never clean them and take your time. It is true, many Liberty 2.5 dollar gold coin values rise and fall with the price of gold. It is also true the potential of far higher value is there should you have a rare date or mintmark. Print the Coin Values Worksheet to list your Liberty $2.5 gold coins and record their values. 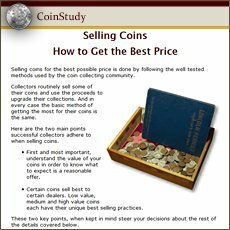 Should you decide to sell... use the worksheet as an invoice and packing slip when sending coins through the mail to dealers. Or carry it with you when visiting dealers.